At long last – a Lock’n'Roll update! Lock’n'Roll, a Pidgin plugin for Windows designed to set an away status message when the PC is locked, has received its first update in three and a half years! Daniel Laberge has forked the project and released a version 1.2 update which allows you to specify which status should be set when the workstation locks. Get it while it’s awesome (always)! Bonus trivia: this is the 200th post on my blog in *checks* six and a half years, wow. 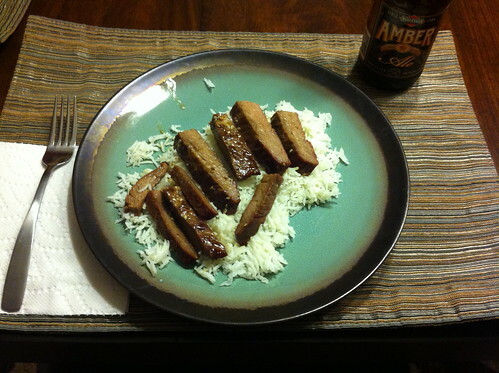 So yes, my last post featured dinner photography too. 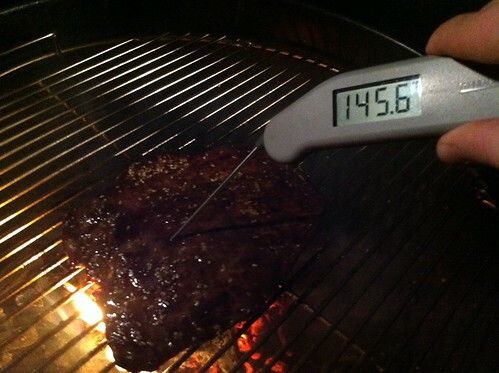 Maybe this is a secret cry for a job as an amateur foodpornographer! 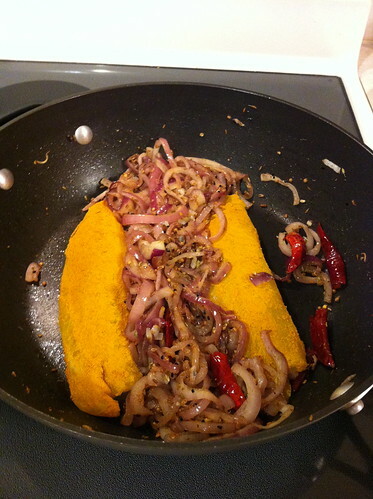 More than likely, however, it happens that Courtney and I make some fine-looking food. 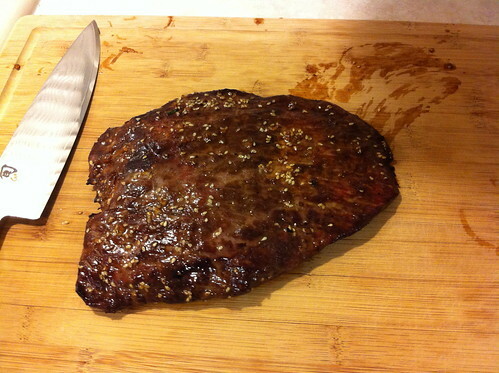 Tonight we took a flank steak out of the freezer and turned that sucker into Bulgogi with One Thousand Sesame Seeds. 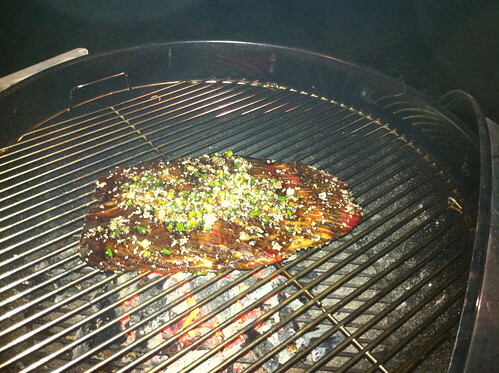 I can’t remember where we got the recipe. We have it on a piece of paper that is clearly a printoff from some untitled Notepad text file. 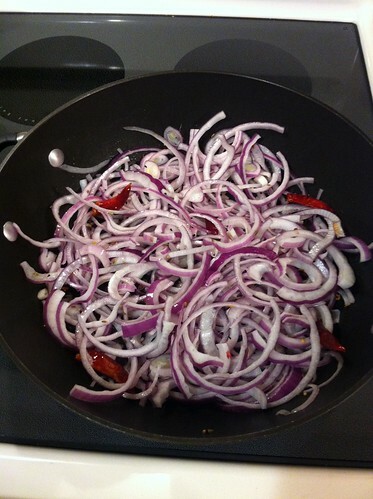 With apologies to the recipe’s originator I replicate it here. 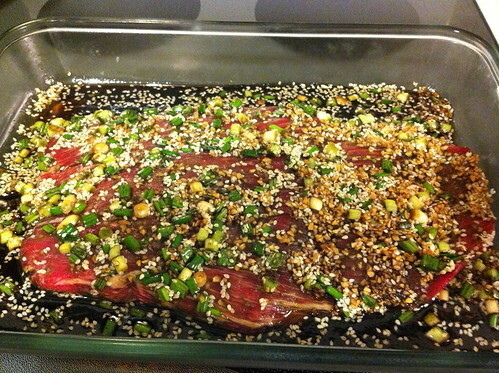 Mix all non-steak ingredients together, pour over the steak, let marinate for an hour at least. Continue flipping it every few minutes until you have a rare medium situation. 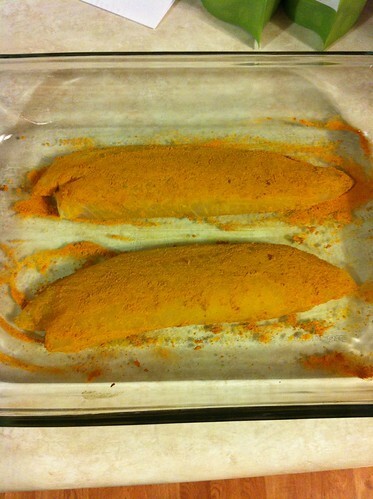 Remove from grill, let it sit for a bit, then slice into slices. Serve over rice or whatever! 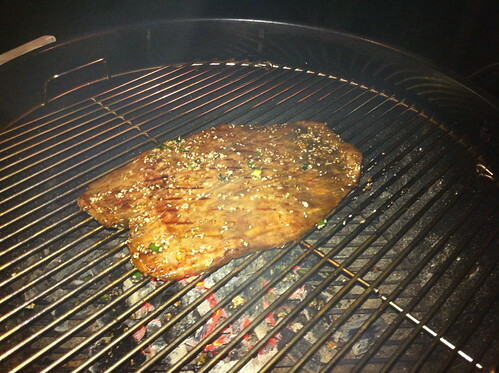 I was cooking dinner Friday night and it just looked so damn good that I felt like taking pictures of it. 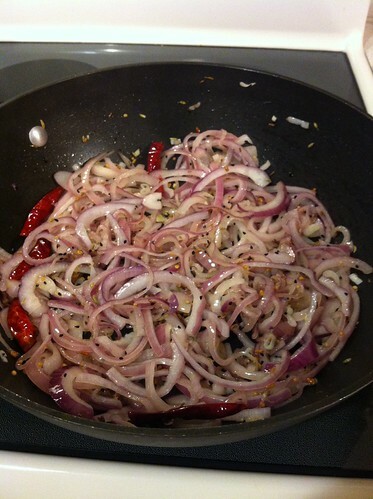 The sh*tload of onions referenced in the title along with dried chilis and a spice blend called panch phoron. 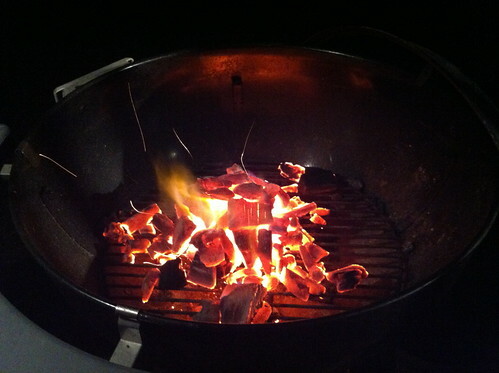 Five minutes later – still a sh*tload but a smaller one. 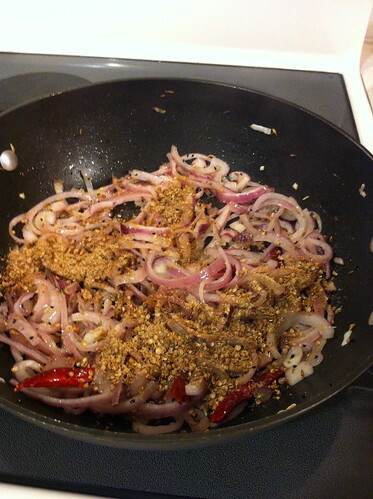 Freshly ground coriander, cumin, cayenne, and salt added into the mix. 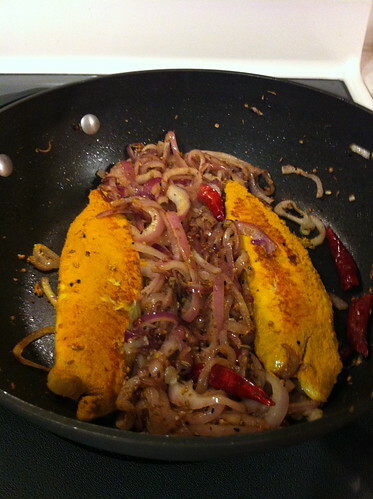 Tilapia filets coated in tumeric. 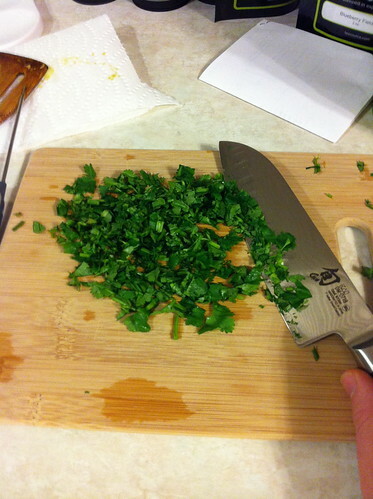 Chopping up some cilantro while that happens. The end result! 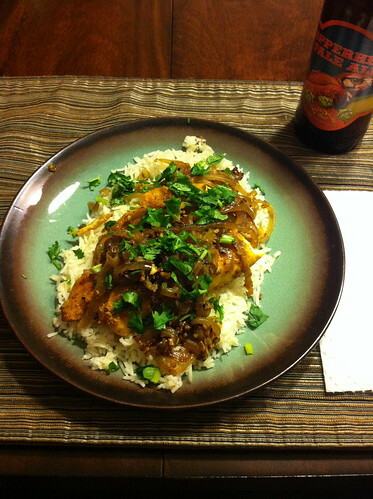 Served over basmati rice with a Copperhead Pale Ale from Free State Beer in Lawrence, KS. 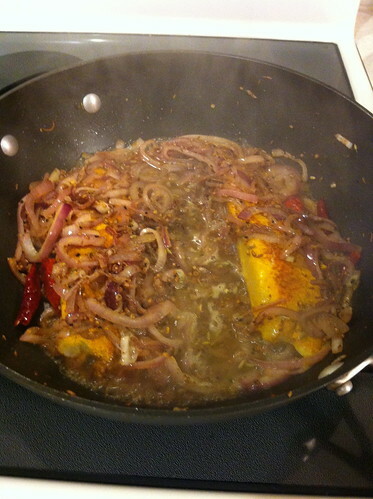 The recipe is “Poached Carp with Chiles and Onions” from 660 Curries by Raghavan Iyer. I very much recommend picking up a copy at your local library, discovering that you love it, and then buying it for yourself. As I post this our home has three different fishtanks in it comprising nearly a hundred gallons of water volume – a 75 gallon tank, a 14 gallon tank, and an 8 gallon tank – and we’ve plans to add more. You’d probably imagine that doing regular water changes would be a royal pain but for the most part it’s not that bad. The 75g and 8g are freshwater tanks which means that water changes involve slightly treated tap water. The 14g, however, is a saltwater tank. Doing a water change on that tank involves five gallons of RODI-filtered water mixed with an artificial salt blend which is supposed to replicate the minerals found in the ocean. RODI stands for “Reverse Osmosis De-Ionized” which is a filtration process which takes for-friggin’-ever but totally purifies the water. 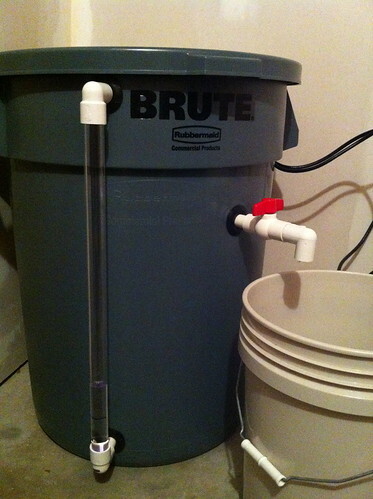 I recently purchased an RODI filter unit so I can make new water at home. 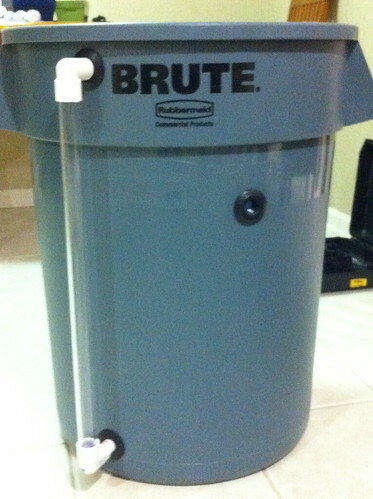 Unfortunately the filter only outputs about 60 gallons a day. 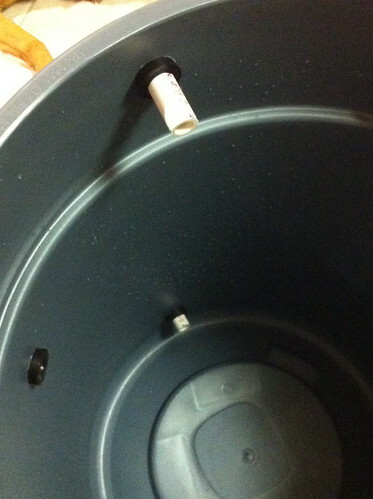 A water change bucket takes two hours to fill. After that the bucket has to be heated to match the tank temperature, the salt has to be added and dissolved, and preferably the whole mess gets transfered to another bucket so that I’m not mixing in the same bucket into which I’m sticking my non-filtered hands during the actual change. This part of aquarium ownership is indeed a royal pain. Not anymore! 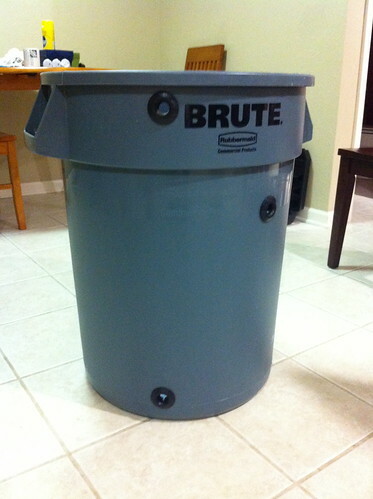 Courtney and I have made a mixing barrel which we’ll use to store thirty gallons of saltwater at a time. 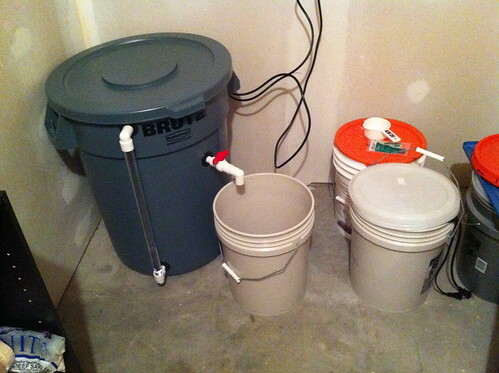 Now when I need to do a water change I’ll just pump five gallons into a handy clean bucket. Presto! What was once a half-day of waiting for water disappears and a water change becomes just a few minutes of doing the actual work. Almost all the pieces for this project. Not pictured: actual barrel. 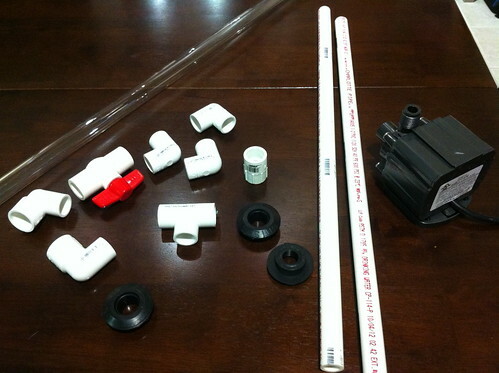 We used 3/4″ clear PVC to create a water level viewer so we can tell at a glance how much water is available without opening the barrel. 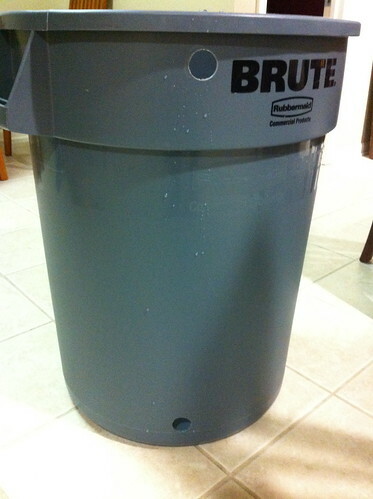 The actual barrel: a 32 gallon Rubbermaid Brute from Home Depot. 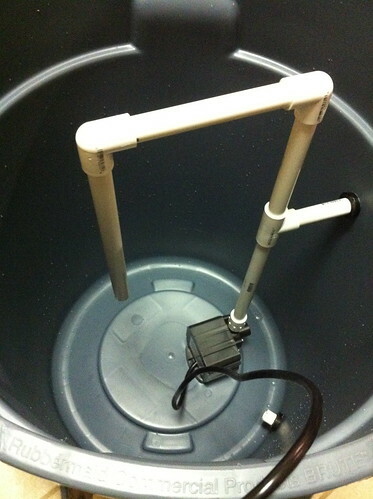 We’ve used a 1-1/4″ diameter hole saw to make the holes for the water level viewer. 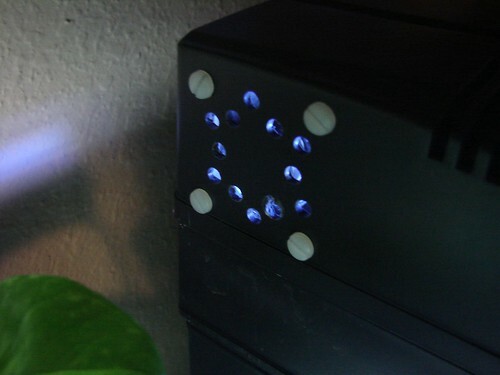 The black circles are Uniseals. These things are awesome. They provide a watertight seal for non-flat surfaces like the curved edge of a barrel. 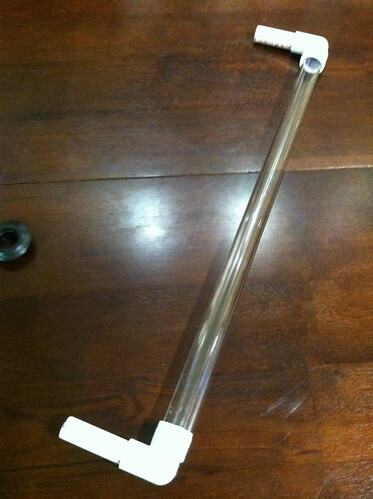 The water level viewer is attached by pushing it through the Uniseals. 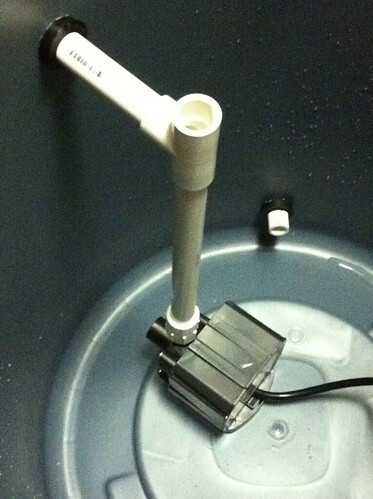 The pump is installed and mostly plumbed. None of this is cemented together so we can take it apart if necessary. 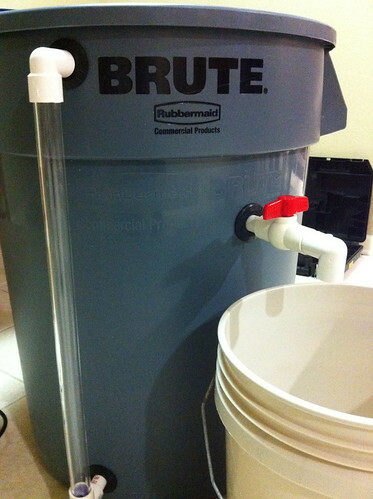 The tap and a five-gallon bucket underneath it. Finishing off the plumbing to let the water continuously circulate. Water in the barrel! The hard-to-see line on the level viewer is the minimum water level – any lower and the pump would start sucking in air. The barrel in its new home in the fish utility room. And now you’re all caught up. 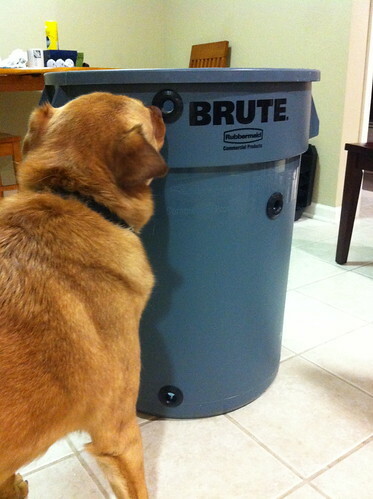 So… the process of buying a house is a long and fairly slow one, but I thought maybe I’d stop in and add some updates. We had a good inspection with just a handful of minor things found that needed fixing. We asked for maybe half of them to be fixed, and the sellers have agreed to do so. We will finish the rest. The appraisal went fine; the house was appraised at what we’re paying for it. We’re well on the road to getting our ducks in a row in terms of the loan, and we’re also working on getting home insurance. Tomorrow we will go to the flooring showroom to look at options for replacing the floors. We’ve decided to just tackle the main, upper floor for now, which is where most but not all of the carpet is. We will re-floor the living room, bedrooms, and hallway, and leave carpet in part of the downstairs family room and the downstairs office, as well as on the stairs. We have also been picking out paint colors, which is exciting. I’ve never lived in a place where I got to pick the color of the walls. There’s also been some shopping for movers to help us with our large, very heavy stuff, and Chris has been working on getting our utilities all set up, too. This is a serious business with lots of things to do. Still loads less stressful than planning a wedding, though. It’s looking like we will get to move near the middle of August, and be out of our old apartment by the first of September! Remember that house from my last blog post? We put an offer on it, and the sellers sent back a counter-offer, which we accepted! So provided the inspection and the appraisal and all those other things go smoothly, this should be our house! We have the inspection scheduled for tomorrow. The contract says we close on July 25 and take possession on July 28. Hooray! News since last week: The house we liked the most from last weekend got an offer the same day we went to go see it, so someone else was the lucky winner there. We liked it a lot, but not enough to put an offer on it immediately. Someone else liked it more. They got a good house, so good for them. Also, we got our loan pre-approval this week. It’s somewhat important that the bank is pretty sure we can borrow money from them, so that’s good news! And really, we should’ve just stopped there. There was one other reasonably nice house, but after this one they all looked pretty poor. This house was a tough act to follow. It’s been very, very well maintained, and where it’s been updated, it’s been updated beautifully. The roof is a few years old, the siding is vinyl and looks very good. Lots of other things are new, and even what’s not new has been kept up very well. There are a lot of floors we’d have to replace, and the fence would need upgrading, but we like this house enough that doing so would be worth it. Aside from those things, there’s really nothing that would have to immediately change for us to move in, which is very, very nice. Stay tuned for updates on this one! Yesterday, we added to our considerable haul of house visits for the weekend with an additional four houses, bringing our total to ten. This house was our favorite house going into this weekend. However, we weren’t as excited about it after we visited it in person. A lot of it seems to be in disrepair or in need of work. The overall picture of the house is pretty good, but the details are kind of alarming. So this one has been moved down to a rather low place on the list. We also visited this house; it was having an open house yesterday. This house is a very nice house with very nice finishes. It’s beautiful inside. But the spaces inside are really quite odd. It has four bedrooms and a whole ton of space on 5 different levels (split ones). But it only has two bathrooms, one of which is a tiny, TINY master bathroom, with a shower just big enough to stand in. And the laundry was all the way down in the basement. The allocation of space in this one is just not very well thought out. I still like it, but it feels like it would need actual remodeling at some point, which is not something I’m really prepared to consider right off the bat. This one was just listed on Saturday, so we saw it the day after it went on the market. The pictures that are out there for this house are just of the outside, so we had no idea what to expect once we went in the front door. But the outside pictures looked nice, and we really like this location and neighborhood, so it was definitely worth a look. And I’m really glad we went! It’s a lovely house on the inside also. You can view some pictures Chris took of the inside here. Someone has clearly kept this house up. The fence in the back is very short, and the only hard floors are in the kitchen and the bathrooms, but the price is very reasonable, so we could change these things fairly easily. This house is not very big; the living area is limited to the raised part of the raised ranch, with the lower level consisting of a garage (of good size!) and an unfinished basement area. I kind of like the fact that the basement remains unfinished; it’s kind of a blank canvas that way. The kitchen is really pretty small, but the counter space is considerable for its size. Chris and I really like this house. It’s our current favorite, but we need more information and more thinking about how much space we need before we can really say if we would like to buy it. Christopher and I went and looked at our very first crop of houses today! We looked at six total, across a wide range of ages, locations, and price ranges. These were all located in Shawnee, our second-choice city, but still one that is a fine choice for house-buying. I think this worked well, particularly in terms of letting us see what is available close to our preferred locations and price range. Somewhat predicably, we liked the more expensive houses more than the cheaper ones. A bit of general information about our house hunt: In addition to looking at houses for the normal things like whether we like the location, the lot, the layout, and all the other things that may or may not start with L, we also have two things in mind that have a lot to do with price. Because I have pretty bad allergies, we’re going to want hard floors in our house. We are planning on making this happen before we move in, because it will much easier to do with no furniture to move. The second issue is Ember, who has an impressive vertical leap and can scale fences with amazing grace. So: a house with hard floors and tall fences is worth much more to us than a house without these things, because they are both things we will have to fix quickly if they are not already part of the house in question. It was very well cared for, and it has absolutely stunning hardwood floors. Which our dogs would, of course, ruin in a heartbeat. But they are very pretty at the moment. The whole house is in pretty good shape and the yard is very nice. An odd thing about it is that the basement flooring looks to be brand-new linoleum, which also looks like it came fresh from the early 90s. It’s not exactly a flooring that meshes well with my decorative tastes, but it’s in fantastic shape, so I’d feel odd about replacing it. It’s priced very close to the top of our price range, and would need a good amount of reflooring and some upgraded fencing. At a slightly lower price point, though, we’d jump on it. So it’s a definite possibility. Chris liked this one more than I did, but we both liked it. It has a nice front porch area, and the fence, while a bit worse for wear, is probably tall enough to keep our airborne dog contained. The floor plan was very nice; the kitchen was well-shaped and the living room had some very nice built-in shelves around the fireplace. The downstairs basement area was pretty much ready to move in, with some nice tile flooring. The master bedroom was also quite nice, with some nice additional bedrooms as well. I was a bit confused at first because this house is no longer blue; it’s now a tan color where the blue used to be. This house had a very interesting layout! It was definitely unlike any other houses we’ve seen, and interesting just in the way it’s put together. The master bedroom is on the main (entry) level with the kitchen, living room, and laundry, with the garage down a half level from that, and the basement/family room area down half a level from the garage. The basement had a lot of nice space, and a walkout door to the backyard. The garage is positioned a little oddly in that, coming in from it, you are deposited halfway up a flight of stairs with not much space to maneuver. You must go up the stairs immediately from there. Up half a level from the main were more bedrooms, and up half a level from that is a nice loft of undetermined purpose. Perhaps just a reading nook or some such? We did like this house, but were not huge fans of the backyard, and it would require a lot of reflooring. Tomorrow evening we will go to visit a few more houses down here in Lenexa, which is our first-choice city to live in. One of those houses is our current favorite according to the pictures we’ve seen, so stay tuned to find out if we like it just as much in person. Why replace the stock fans? The bearings on the fans that come integrated into the hood are pretty lousy. Users frequently report that they start making grinding noises and fail to turn. Unfortunately my tank was no exception. 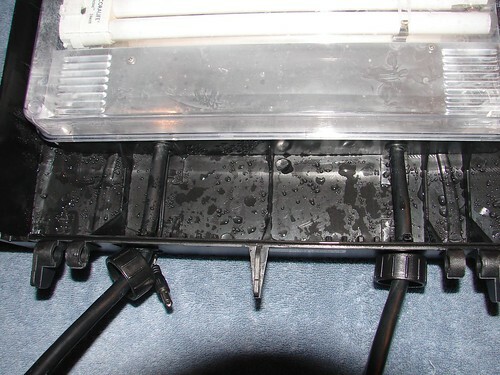 The Biocubes also have a problem with condensation forming on the inside of the hood. Normally this is no problem but whenever the lid gets raised a lot of water runs down the back which isn’t good for the wiring or the carpet. I found a couple of guides showing how others had done this retrofit and I combined their approaches. Step one: remove the hood. The Biocube’s hood has two plastic hinges which are held together by a pin. 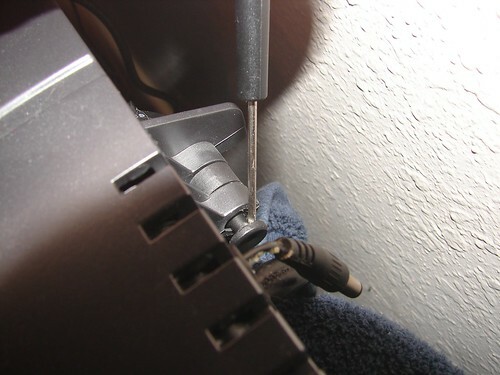 Slip a screwdriver into one end and gently pry. Step two: remove the plastic lid and (carefully) remove the bulbs. 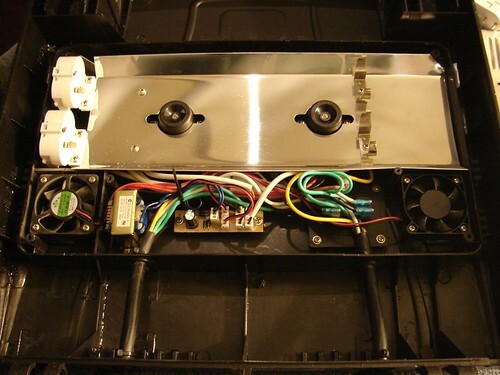 Step three: remove the metal covering the hood electronics. Now here was where I was hoping to save some work. My plan was to put four new fans in the hood where previously there were only two. I’d have liked to wire them into the existing power supply and not have to run a new one – one less plug to deal with after all – but no dice. 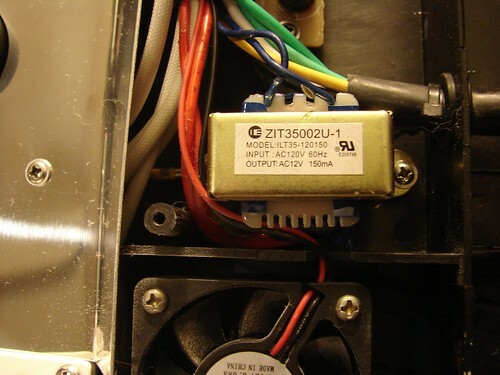 Not only is there not nearly enough amperage (my new fans draw 110 mA each and this transformer only puts out 150 total) but it’s AC instead of DC. Oh well. New fan on the left, old fan on the right. The new ones are Sunon MagLev fans which are reputed to have much nicer bearings. Step four: remove the old fans. 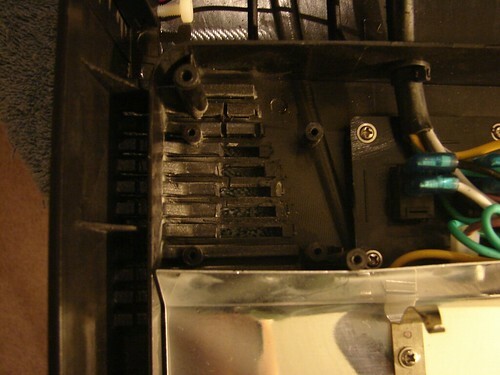 Step five, optional: hack away the airflow restricting interior fins underneath the stock fans. I did this using a Dremel with a flexible extension – there isn’t a lot of room going on in here. 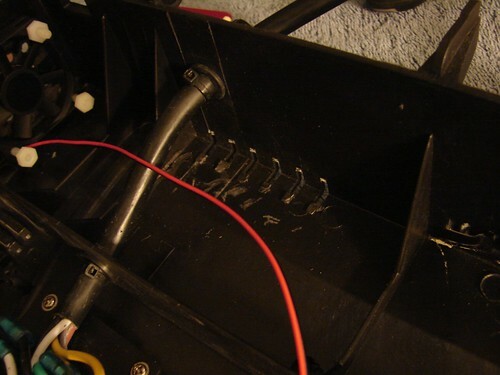 Step five continued: do the same with the airflow restrictors along the back. Step six: drill intakes and mounting holes for two fans in the back both blowing inward. This is a slightly harder modification than just replacing the stock fans but it is worth it. These two fans have basically eliminated the condensation problem. It comes at a cost: evaporation goes way way up. I’d recommend an auto-topoff if you are going to go the four-fan route. 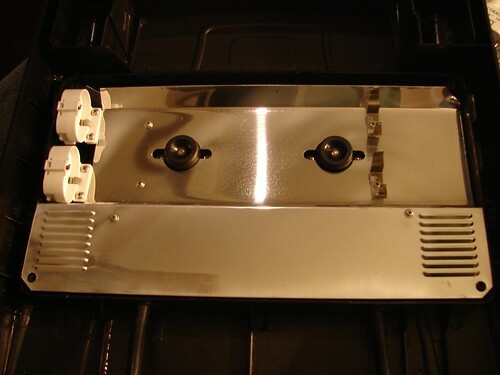 A twelve-hole pattern drilled for the intakes of rear fans plus four for mounting. I used nylon screws so there’d be no chance of rusting over time. All four fans mounted up. Step seven: wiring up the fans. I used a charger from an old phone which puts out 700 mA at 5VDC. 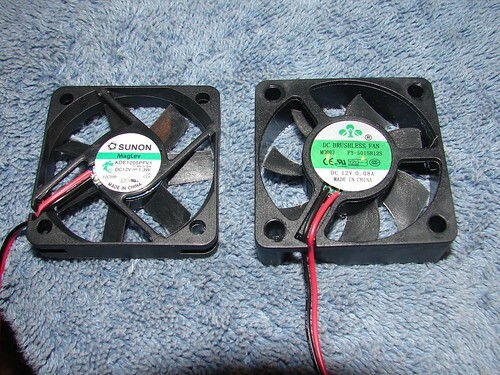 The Sunon fans are rated for 12V so running them at 5 is undervolting them rather a lot but that’s okay. Despite having good bearings they aren’t particularly quiet. I tried running them flat-out at 12V and it sounded like a jet engine was taking off in my living room. 5V seems a good compromise for air movement versus noise. 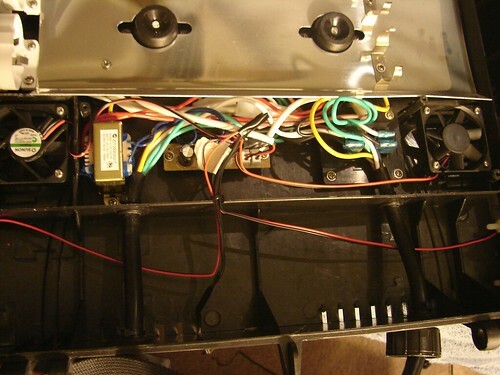 All four red fan wires tied to the positive output of the power supply, all four black wires tied to the negative output. Seal it up with some electrical tape and away we go. And that’s it! 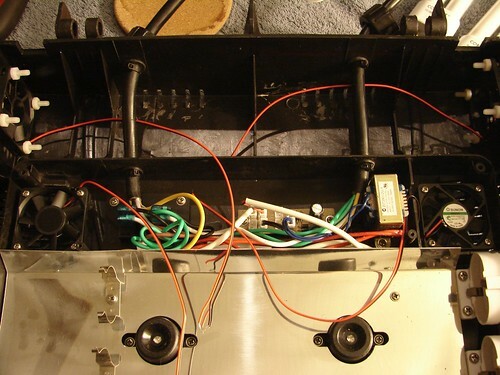 Replace the metal electronics cover, the bulbs, and the plastic light cover and plug it all in. The hood is much quieter after having replaced the stock fans. Condensation is a thing of the past. The hood isn’t silent by a long shot…but that wasn’t really the point. The general temperature of the tank is lower than it was with only two fans but it’s still very warm. 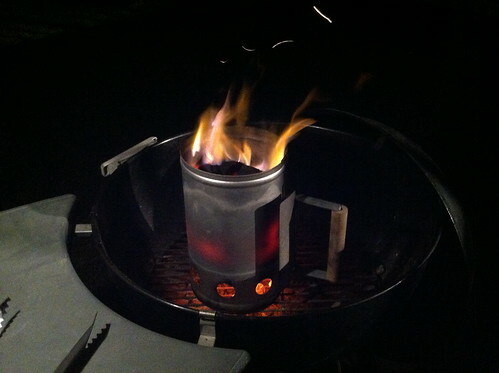 Eventually – like in a couple of weeks – the stock lighting needs to come out and get replaced with LEDs lest my tank come to a slow boil over the summer.